What if divided neighborhoods were causing public health problems? What if a new approach to planning and design could tackle both the built environment and collective well-being at the same time? 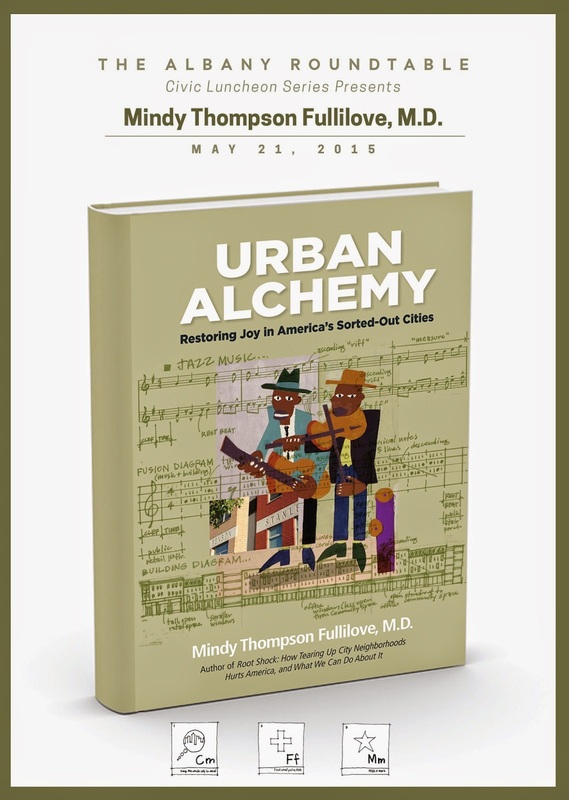 Dr. Mindy Thompson Fullilove, author of Urban Alchemy: Finding Joy in America’s Sorted Out Cities (New Village Press – June 4, 2013) will be the featured speaker at the Albany Roundtable’s Annual Meeting on Thursday, May 21, 2015. The event is open to the public, and will be held at the National Register-listed University Club of Albany, 141 Washington Avenue at Dove Street. The meeting will take place from 6:00 – 8:00 p.m., and will feature a social hour with cocktails and hors d’oeuvres, a short update on the Albany Roundtable Civic Luncheon Series, the presentation of the Good Patroon Award, the presentation of two Albany Roundtable Scholarships for Civic Leadership, and a talk and book signing by the Visiting Speaker. Tickets are $40 and include light fare and open bar. Books will be available for $20 (including tax) courtesy of the Book House of Stuyvesant Plaza. Dr. Fullilove is a board-certified psychiatrist at the Columbia University Mailman School of Public Health. She uses her unique perspective as a public health psychiatrist to explore and identify ways of healing social and spatial fractures simultaneously. Citing the work of French urbanist Michel Cantal-Dupart and the American urban design firm Rothschild Doyno Collaborative and using urban restoration projects from France and the US as case studies, Fullilove has identified nine tools that can mend our broken cities and reconnect our communities to make them whole. Corporate sponsors for the event are: The Capital District Regional Planning Commission; The Center for Economic Growth; and the Society of Architectural Historians, Turpin Bannister Chapter. Dr. Fullilove began her research career examining the AIDS epidemic among people of color in the US. As it became clear that AIDS was related to place not race, she began a series of studies on the psychology of place. Her theories on place and human well being provide the framework for her current work on the long-term consequences of urban renewal. This work has made her keenly aware of the environmental challenges that face American cities. At the evening reception, the Albany Roundtable will present its Good Patroon Award to Historic Albany Foundation for the organization’s unwavering commitment to protecting Albany’s built environment for more than 40 years. The Good Patroon Award was established by the Albany Roundtable in 1988 to recognize outstanding contributions to the community by institutions and individuals. The Albany Roundtable will also present two $1,000 scholarships to high school seniors for demonstrated civic leadership. The Albany Roundtable’s previous Visiting Speakers have included Kaid Benfield (People Habitat: 25 Ways to Think About Greener, Healthier Cities); Jeff Speck (Walkable City); John Norquist (CEO, Congress for the New Urbanism); Janet Flammang (The Taste for Civilization); Colin Beavan (No Impact Man), Jaime Correa (planner, architect and professor at the University of Miami) and others. Tickets for the reception must be purchased by Monday, May 18. For more information, email albanyroundtable@yahoo.com or call The University Club at 518-463-1151. Too bad this is on the night of the Workforce Challenge, I'd love to attend, but I'm already obligated to run the race.